For on-premises development, you can use either HANA System Replication or use shared storage to establish high availability for SAP HANA. On Azure virtual machines (VMs), HANA System Replication on Azure is currently the only supported high availability function. SAP HANA Replication consists of one primary node and at least one secondary node. Changes to the data on the primary node are replicated to the secondary node synchronously or asynchronously. 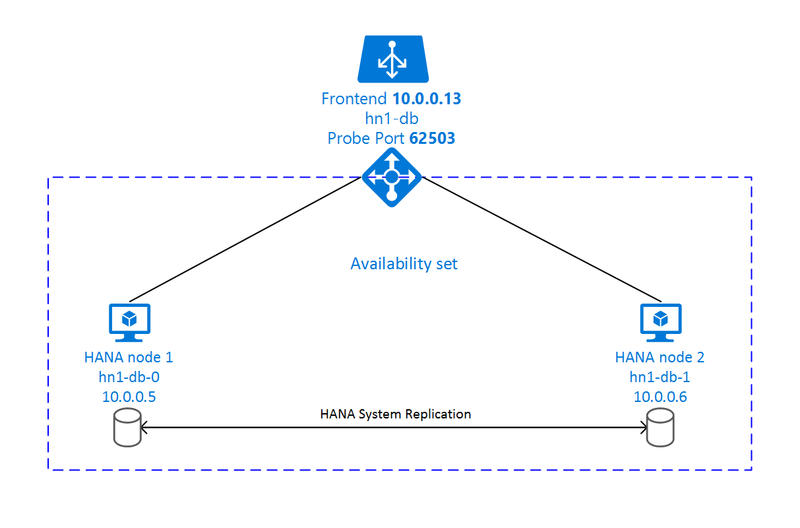 This article describes how to deploy and configure the virtual machines, install the cluster framework, and install and configure SAP HANA System Replication. In the example configurations, installation commands, instance number 03, and HANA System ID HN1 are used. The list of Azure VM sizes that are supported for the deployment of SAP software. Important capacity information for Azure VM sizes. The supported SAP software, and operating system (OS) and database combinations. The required SAP kernel version for Windows and Linux on Microsoft Azure. SAP Note 2015553 lists the prerequisites for SAP-supported SAP software deployments in Azure. SAP Note 2205917 has recommended OS settings for SUSE Linux Enterprise Server for SAP Applications. SAP Note 1944799 has SAP HANA Guidelines for SUSE Linux Enterprise Server for SAP Applications. SAP Note 2178632 has detailed information about all of the monitoring metrics that are reported for SAP in Azure. SAP Note 2191498 has the required SAP Host Agent version for Linux in Azure. SAP Note 2243692 has information about SAP licensing on Linux in Azure. SAP Note 1984787 has general information about SUSE Linux Enterprise Server 12. SAP Note 1999351 has additional troubleshooting information for the Azure Enhanced Monitoring Extension for SAP. SAP Note 401162 has information on how to avoid "address already in use" when setting up HANA System Replication. SAP Community WIKI has all of the required SAP Notes for Linux. Azure Virtual Machines planning and implementation for SAP on Linux guide. Azure Virtual Machines deployment for SAP on Linux (this article). Azure Virtual Machines DBMS deployment for SAP on Linux guide. Setting up an SAP HANA SR Performance Optimized Infrastructure (SLES for SAP Applications 12 SP1). The guide contains all of the required information to set up SAP HANA System Replication for on-premises development. Use this guide as a baseline. To achieve high availability, SAP HANA is installed on two virtual machines. The data is replicated by using HANA System Replication. The resource agent for SAP HANA is included in SUSE Linux Enterprise Server for SAP Applications. The Azure Marketplace contains an image for SUSE Linux Enterprise Server for SAP Applications 12 that you can use to deploy new virtual machines. Open the database template or the converged template on the Azure portal. The database template creates the load-balancing rules for a database only. The converged template also creates the load-balancing rules for an ASCS/SCS and ERS (Linux only) instance. If you plan to install an SAP NetWeaver-based system and you want to install the ASCS/SCS instance on the same machines, use the converged template. Sap System ID: Enter the SAP system ID of the SAP system you want to install. The ID is used as a prefix for the resources that are deployed. Stack Type: (This parameter is applicable only if you use the converged template.) Select the SAP NetWeaver stack type. Os Type: Select one of the Linux distributions. For this example, select SLES 12. Sap System Size: Enter the number of SAPS that the new system is going to provide. If you're not sure how many SAPS the system requires, ask your SAP Technology Partner or System Integrator. Admin Username and Admin Password: A new user is created that can be used to sign in to the machine. New Or Existing Subnet: Determines whether a new virtual network and subnet should be created or an existing subnet used. If you already have a virtual network that's connected to your on-premises network, select Existing. Subnet ID: If you want to deploy the VM into an existing VNet where you have a subnet defined the VM should be assigned to, name the ID of that specific subnet. The ID usually looks like /subscriptions/<subscription ID>/resourceGroups/<resource group name>/providers/Microsoft.Network/virtualNetworks/<virtual network name>/subnets/<subnet name>. Set the max update domain. Create a load balancer (internal). Select the virtual network created in step 2. Use a SLES4SAP image in the Azure gallery that is supported for SAP HANA on the VM type you selected. Select the availability set created in step 3. Open the load balancer, select frontend IP pool, and select Add. Enter the name of the new front-end IP pool (for example, hana-frontend). Set the Assignment to Static and enter the IP address (for example, 10.0.0.13). After the new front-end IP pool is created, note the pool IP address. Open the load balancer, select backend pools, and select Add. Enter the name of the new back-end pool (for example, hana-backend). Select Add a virtual machine. Select the virtual machines of the SAP HANA cluster. Open the load balancer, select health probes, and select Add. Enter the name of the new health probe (for example, hana-hp). Select TCP as the protocol and port 62503. Keep the Interval value set to 5, and the Unhealthy threshold value set to 2. Open the load balancer, select load balancing rules, and select Add. Enter the name of the new load balancer rule (for example, hana-lb-30315). Select the front-end IP address, the back-end pool, and the health probe that you created earlier (for example, hana-frontend). Keep the Protocol set to TCP, and enter port 30315. Increase the idle timeout to 30 minutes. Make sure to enable Floating IP. Repeat these steps for port 30317. Enter the name of the new load balancer rule (for example, hana-lb-30313). Keep the Protocol set to TCP, and enter port 30313. Repeat these steps for port 30314. Enter the name of the new load balancer rule (for example, hana-lb-30340). Select the frontend IP address, backend pool, and health probe you created earlier (for example, hana-frontend). Keep the Protocol set to TCP, and enter port 30340. Repeat these steps for ports 30341 and 30342. For more information about the required ports for SAP HANA, read the chapter Connections to Tenant Databases in the SAP HANA Tenant Databases guide or SAP Note 2388694. Do not enable TCP timestamps on Azure VMs placed behind Azure Load Balancer. Enabling TCP timestamps will cause the health probes to fail. Set parameter net.ipv4.tcp_timestamps to 0. For details see Load Balancer health probes. See also SAP note 2382421. Follow the steps in Setting up Pacemaker on SUSE Linux Enterprise Server in Azure to create a basic Pacemaker cluster for this HANA server. You can use the same Pacemaker cluster for SAP HANA and SAP NetWeaver (A)SCS. [A]: The step applies to all nodes. : The step applies to node 1 only. : The step applies to node 2 of the Pacemaker cluster only. [A] Set up the disk layout: Logical Volume Manager (LVM). We recommend that you use LVM for volumes that store data and log files. The following example assumes that the virtual machines have four data disks attached that are used to create two volumes. Create the logical volumes. A linear volume is created when you use lvcreate without the -i switch. We suggest that you create a striped volume for better I/O performance, where the -i argument should be the number of the underlying physical volume. In this document, two physical volumes are used for the data volume, so the -i switch argument is set to 2. One physical volume is used for the log volume, so no -i switch is explicitly used. Use the -i switch and set it to the number of the underlying physical volume when you use more than one physical volume for each data, log, or shared volumes. [A] Set up the disk layout: Plain Disks. [A] Set up host name resolution for all hosts. To install SAP HANA System Replication, follow chapter 4 of the SAP HANA SR Performance Optimized Scenario guide. Select additional components for installation: Enter 1. Enter Installation Path [/hana/shared]: Select Enter. Enter Local Host Name [..]: Select Enter. Do you want to add additional hosts to the system? (y/n) [n]: Select Enter. Enter SAP HANA System ID: Enter the SID of HANA, for example: HN1. Enter Instance Number : Enter the HANA Instance number. Enter 03 if you used the Azure template or followed the manual deployment section of this article. Select Database Mode / Enter Index : Select Enter. Select System Usage / Enter Index : Select the system usage value. Enter Location of Data Volumes [/hana/data/HN1]: Select Enter. Enter Location of Log Volumes [/hana/log/HN1]: Select Enter. Restrict maximum memory allocation? [n]: Select Enter. Enter Certificate Host Name For Host '...' [...]: Select Enter. Enter SAP Host Agent User (sapadm) Password: Enter the host agent user password. Confirm SAP Host Agent User (sapadm) Password: Enter the host agent user password again to confirm. Enter System Administrator (hdbadm) Password: Enter the system administrator password. Confirm System Administrator (hdbadm) Password: Enter the system administrator password again to confirm. Enter System Administrator Home Directory [/usr/sap/HN1/home]: Select Enter. Enter System Administrator Login Shell [/bin/sh]: Select Enter. Enter System Administrator User ID : Select Enter. Enter ID of User Group (sapsys) : Select Enter. Enter Database User (SYSTEM) Password: Enter the database user password. Confirm Database User (SYSTEM) Password: Enter the database user password again to confirm. Restart system after machine reboot? [n]: Select Enter. Do you want to continue? (y/n): Validate the summary. Enter y to continue. [A] Upgrade the SAP Host Agent. If you're using SAP HANA 2.0 or MDC, create a tenant database for your SAP NetWeaver system. Replace NW1 with the SID of your SAP system. hdbsql -d SYSTEMDB -u SYSTEM -p "passwd" -i 03 "BACKUP DATA USING FILE ('initialbackupSYS')"
hdbsql -d HN1 -u SYSTEM -p "passwd" -i 03 "BACKUP DATA USING FILE ('initialbackupHN1')"
hdbsql -d NW1 -u SYSTEM -p "passwd" -i 03 "BACKUP DATA USING FILE ('initialbackupNW1')"
[A] Create the keystore entry. hdbsql -d SYSTEMDB -u system -i 03 "BACKUP DATA USING FILE ('initialbackup')"
hdbsql -d HN1 -u system -i 03 "BACKUP DATA USING FILE ('initialbackup')"
 Configure System Replication on the first node. Configure System Replication on the secondary node. # Replace the bold string with your instance number, HANA system ID, and the front-end IP address of the Azure load balancer. # Clean up the HANA resources. The HANA resources might have failed because of a known issue. Make sure that the cluster status is ok and that all of the resources are started. It's not important on which node the resources are running. This section describes how you can test your setup. Every test assumes that you are root and the SAP HANA master is running on the hn1-db-0 virtual machine. If you set AUTOMATED_REGISTER="false", this sequence of commands should migrate the SAP HANA master node and the group that contains the virtual IP address to hn1-db-1. The virtual machine should now restart or stop depending on your cluster configuration. If you set the stonith-action setting to off, the virtual machine is stopped and the resources are migrated to the running virtual machine. You can test the setup of SBD by killing the inquisitor process. Cluster node hn1-db-0 should be rebooted. The Pacemaker service might not get started afterwards. Make sure to start it again. Run all test cases that are listed in the SAP HANA SR Performance Optimized Scenario or SAP HANA SR Cost Optimized Scenario guide, depending on your use case. You can find the guides on the SLES for SAP best practices page. The following tests are a copy of the test descriptions of the SAP HANA SR Performance Optimized Scenario SUSE Linux Enterprise Server for SAP Applications 12 SP1 guide. For an up-to-date version, always also read the guide itself. Always make sure that HANA is in sync before starting the test and also make sure that the Pacemaker configuration is correct. In the following test descriptions we assume PREFER_SITE_TAKEOVER="true" and AUTOMATED_REGISTER="false". NOTE: The following tests are designed to be run in sequence and depend on the exit state of the preceding tests. Pacemaker should detect the stopped HANA instance and failover to the other node. Once the failover is done, the HANA instance on node hn1-db-0 is stopped because Pacemaker does not automatically register the node as HANA secondary. Run the following commands to register node hn1-db-0 as secondary and cleanup the failed resource. Pacemaker should detect the stopped HANA instance and failover to the other node. Once the failover is done, the HANA instance on node hn1-db-1 is stopped because Pacemaker does not automatically register the node as HANA secondary. Run the following commands to register node hn1-db-1 as secondary and cleanup the failed resource. Pacemaker should detect the killed HANA instance and failover to the other node. Once the failover is done, the HANA instance on node hn1-db-0 is stopped because Pacemaker does not automatically register the node as HANA secondary. Pacemaker should detect the killed HANA instance and failover to the other node. Once the failover is done, the HANA instance on node hn1-db-1 is stopped because Pacemaker does not automatically register the node as HANA secondary. Pacemaker should detect the killed cluster node and fence the node. Once the node is fenced, Pacemaker will trigger a takeover of the HANA instance. When the fenced node is rebooted, Pacemaker will not start automatically. Run the following commands to start Pacemaker, clean the SBD messages for node hn1-db-0, register node hn1-db-0 as secondary, and cleanup the failed resource. Run the following commands to start Pacemaker, clean the SBD messages for node hn1-db-1, register node hn1-db-1 as secondary, and cleanup the failed resource. Pacemaker will detect the stopped HANA instance and mark the resource as failed on node hn1-db-1. Pacemaker should automatically restart the HANA instance. Run the following command to clean up the failed state. Pacemaker will detect the killed HANA instance and mark the resource as failed on node hn1-db-1. Run the following command to clean up the failed state. Pacemaker should then automatically restart the HANA instance. Pacemaker should detect the killed cluster node and fence the node. When the fenced node is rebooted, Pacemaker will not start automatically. Run the following commands to start Pacemaker, clean the SBD messages for node hn1-db-1, and cleanup the failed resource.